This month with baby girl has been a blast. She loves to play so much more and is a joy to be around. Lots of new changes this month! See below. Clothing size: Mostly 6 month clothes, some 3 month still fit (or at least I try to make them fit- denial). Feedings: Adalyn breastfeeds usually 5 times per day (about 6, 9, 12, 3:30 and 7). Sometimes there may be one extra feeding thrown in there. She eats 2 solid meals a day, sometimes 3. She is an excellent eater and must eat anytime we are eating a meal- or else! She has tried many new foods this month. Her favorites seem to be: beans, applesauce, kale and bread. I am still making all of her food homemade which is easy. We do a mix of whole foods (baby led weaning) and purees. She gets baby oatmeal one time per day for the iron. She loves to eat and has an awesome appetite (like me...). Some new foods this month were: whole grain waffles, blue cheese, radish, all the fruits and veggies, venison, chicken, berries, strawberries (she loves these!!) and lots more. This past month, we pretty much eliminated all nighttime feeds!!!! When Adalyn wakes up at night, she is now usually able to put herself back to bed without eating. This is amazing for me. Last month, we cut out the 5:30 PM feeding because she was eating at 3:30, 5:30 and 7 which I thought was too much. The addition of the solid foods really helped this. We got her off of her Zantac which is going awesome! She is spitting up a lot less which I am thrilled about. Sleep: Bedtime is 7-7:15 PM each night. Falling asleep is getting easier some nights, other nights it may take an hour. We are still doing the Halo swaddle for some naps for the Baby Merlin Magic Sleepsuit at night which I highly recommend. Right after we started this, Adalyn started sleeping through the whole night most nights. Bedtime routine: diaper change, pajamas, sleepsuit, breastfeed, wubbanub pacifier and bed. We do not rock her to sleep but put her down awake. I have been singing her some songs which she enjoys. Naps: Usually 3 per day and awake time is for 2 hours before the next nap. She gets fussy around this time like clockwork. Nicknames: (back by popular demand)- Boo Boo, Boo Boo Stinky, Dooley, Doo Lyn, Dooley Doo, etc. etc. -Adalyn sits up on her own really well and rarely falls over now. This has meant that we retired her swing, bouncer, etc. -Can "crawl" backwards really well. We will put her in one spot and she will be 4 feet away a few minutes later. -Has teeth!!! Her bottom left one started coming in at Easter and the one right next to it is now starting to break the surface. -Rolling from front to back finally- it's not that I think she couldn't do it but now she finally wanted to. -Gives kisses!!!! Sloppy, wet, opened mouth kisses that I love so much. The best. -Now sits in the regular stroller without her car seat. -The dogs are her best friends- she pets them and stares at whatever they are doing. -Can play for at least an hour straight. Favorite toys are this Fisher Price lunchbox which she will literally play with for an hour and the Fisher Price laugh and learn puppy. -Tries to sit up so badly. -On Easter, she learned to jump up and down when we hold her. She is also starting to be able to imitate me dancing. If I start dancing like crazy, she will wave her arms in the air and start jumping. -Crawled forward just 1 time (1 week shy of 7 months)- She is working on this still but always ends up going backwards instead. -Grabs everything including all of the fruit at our produce market, my hair, the skin on my face, plates, silverware, etc. 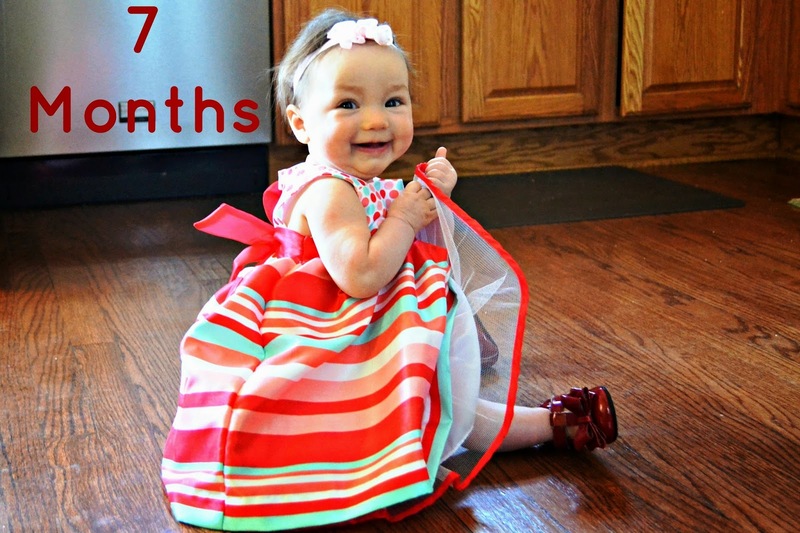 -For the most part, she is a super happy baby and laughs a lot and smiles. She loves strangers still. When someone says hi to her at the grocery store, she flashes them a huge grin. -She loves her whole family so much! -She picks up toys when she sees them and they usually end up right in her mouth.